Efficient storage and retrieval of digital data is the focus of much commercial and academic attention. With personal computers, there are two main ways to retrieve files: hierarchical navigation and query-based search. In navigation, users move down their virtual folder hierarchy until they reach the folder in which the target item is stored. When searching, users first generate a query specifying some property of the target file (e.g., a word it contains), and then select the relevant file when the search engine returns a set of results. Despite advances in search technology, users prefer retrieving files using virtual folder navigation, rather than the more flexible query-based search. 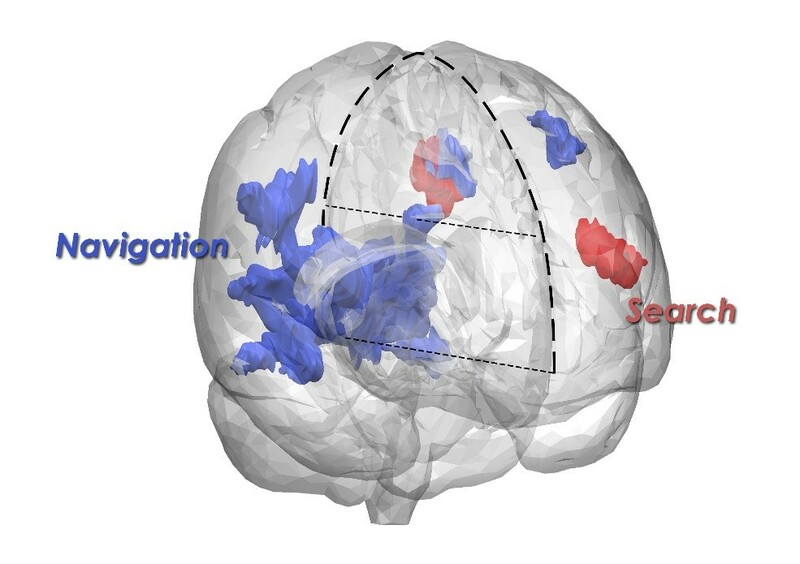 In the talk, we will present an interdisciplinary study recently published in Scientific Reports (Nature Publication Group) where we used fMRI to investigate this phenomenon. Our findings reveal that navigation resulted in activation of regions similar to that previously observed during real-world navigation in both animals and humans (e.g. the retrosplenial cortex). In contrast, searching activated the left inferior frontal gyrus (Broca’s area), commonly observed in linguistic processing. In our talk, we will discuss the implication of these results. In addition, we will present a unique 3D model of the brain activations for both navigation and search, and conclude with a promising direction for future research. Dr. Yael Benn is an experimental psychology researcher, and from January 2016, a lecturer in the dept. of Psychology at Manchester Metropolitan University. Her research focuses on information seeking and avoidance behavior (both affective and cognitive mechanisms), and the role of linguistic resources within it. Her work uses multiple methodologies, including fMRI, EEG, behavioral and neuropsychological cases in order to address important theoretical questions with regards to human cognition. To date, her studies have been published in high impact journals (e.g., Psychological Bulletin). She presented her work at several prestige conferences (e.g., the European Association of Social Psychology, the European Health Psychology Society) and given invited talks in academic institutions and commercial organizations. Dr. Benn graduated in 2003 with a 1st class honours in computer science from the university of Strathclyde, Glasgow. In 2010, she completed a PhD in cognitive neuroscience, which was followed by a Wellcome Trust ‘Value in People’ Fellowship and a 4-year post-doctoral position at the University of Sheffield. Dr. Ofer Bergman is one of the leading researchers in the field of Personal Information Management (PIM) and the first to use neuro-imaging to study it. His main research achievements are: (a) Constructing the user-subjective approach, which is the first designated approach to PIM systems design; (b) Providing evidence against two strongly rooted directions for PIM systems – search and multiple-classification; and (c) Developing a novel research method called "Elicited Personal Information Retrieval". He received several grants and awards including two recent Google Faculty Awards. He was invited to lecture at top rated international institutes including the MIT Media Lab, the Human-Computer Interaction Lab (University of Maryland), Microsoft Research Cambridge Lab (UK) and the National Institute of Informatics (Tokyo).